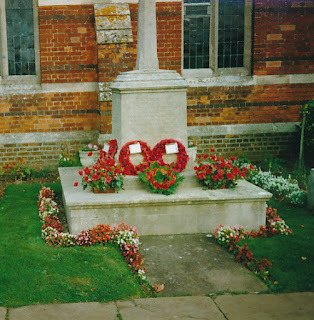 The Eton Wick History Group laid its first wreath on the village War Memorial on Remembrance Sunday 1999. They have continued to do this each year since then and will be doing so again today. During 1917 11 men who called Eton Wick their home died in the service of the country. Private Herbert Pithers - Killed in action at Ancre and is commemorated on the Thiepval Memorial. James John Newell (Trooper No. 1232) - 10th Brigade 4th Division (Formerly Trooper No. 3831 - The Life Guards) - Killed in action at Arras and he is buried in the Athies Communal Cemetery Extension in France. John Carfrae Clark (Gunner No. 630936) - Killed in action at Roeux and he is buried in the nearby cemetery of Anzin-St-Aubin. Joseph Newell (Private No. 9534) - 1st Battalion Oxfordshire and Buckinghamshire Light Infantry - 17th Brigade - 6th (Poona) Division - He died in a Turkish Prisoner of War camp and is commemorated on the Basra Memorial in Iraq. Charles Miles (Stoker 1st Class K25314) - H.M.S. Vanguard Royal Navy - Killed when HMS Vanguard blew up and sank with its entire crew. He is commemorated on the Chatham Naval Memorial in Kent. Arthur Bunce (Private No. 39794) - 3rd Battalion Worcestershire Regiment - 7th Brigade - 25th Division - Killed in action at Messines Ridge and he is buried in the Messines Ridge British Cemetery, Messines, Belgium. Alfred Brown (Private No. 11811) - 2nd Battalion Grenadier Guards - 4th (Later 1st) Guards Brigade - Guards Division - Killed in action at the start of the Third Battle of Ypres and he is buried in Artillery Wood Cemetery at Boesinghe. Henry Charles Hill (Stoker 1st Class No. 1/18991) - H.M.S. Pembroke - Chatham - Royal Navy. He was killed during an air raid at Chatham Naval Barracks and he is buried in the Gillingham Naval Plot. Robert Thomas Hobrough M.M. (Sergeant No. 40782) - Royal Engineers - No. 7 Signal Section Royal Engineers - Killed in action during the Third Battle of Ypres and is commemorated on the Memorial to the Missing, Panel 8, at Tyne Cot in Belgium. Ernest Brown (Private No. T/202287) 3rd/4th Battalion The Queens Royal West Surrey Regiment – 62nd Brigade – 21st Division - Killed in action during the Third Battle of Ypres and is commemorated on a wall plaque in the Tyne Cot Cemetery. Cyril Arthur Ashman - (Private No. 746) 2nd Battalion Honourable - Artillery Company 22nd Brigade - 7th Division - Killed in action at Gheluvelt and is buried in the military cemetery known as Tyne Cot.